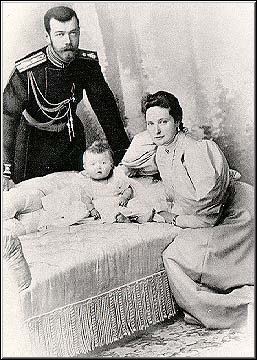 Bolshevik authorities at first reported that the Romanov emperor had been shot after the discovery of a plot to liberate him. For some time the deaths of the Empress and the children were kept secret. Soviet historians claimed for many years that local Bolsheviks had acted on their own in carrying out the killings, and that Lenin, founder of the Soviet state, had nothing to do with the crime. In 1990, Moscow playwright and historian Edvard Radzinsky announced the result of his detailed investigation into the murders. He unearthed the reminiscences of Lenin's bodyguard, Alexei Akimov, who recounted how he personally delivered Lenin's execution order to the telegraph office. The telegram was also signed by Soviet government chief Yakov Sverdlov. Akimov had saved the original telegraph tape as a record of the secret order. My next visit to Moscow took place after the [temporary] fall of Ekaterinburg [to anti-Communist forces]. Speaking with Sverdlov, I asked in passing: "Oh yes, and where is the Tsar?" "Finished," he replied. "He has been shot." "And where is the family?" "The family along with him." "All of them?," I asked, apparently with a trace of surprise. "All of them," replied Sverdlov. "What about it?" He was waiting to see my reaction. I made no reply. "And who made the decision?," I asked. "We decided it here. Ilyich [Lenin] believed that we shouldn't leave the Whites a live banner to rally around, especially under the present difficult circumstances." I asked no further questions and considered the matter closed. A solid understanding of history has long been the best guide to comprehending the present and anticipating the future. Accordingly, people are most interested in historical questions during times of crisis, when the future seems most uncertain. With the collapse of Communist rule in the Soviet Union, 1989-1991, and as Russians struggle to build a new order on the ruins of the old, historical issues have become very topical. For example, many ask: How did the Bolsheviks, a small movement guided by the teachings of German-Jewish social philosopher Karl Marx, succeed in taking control of Russia and imposing a cruel and despotic regime on its people? In recent years, Jews around the world have been voicing anxious concern over the specter of anti-Semitism in the lands of the former Soviet Union. In this new and uncertain era, we are told, suppressed feelings of hatred and rage against Jews are once again being expressed. According to one public opinion survey conducted in 1991, for example, most Russians wanted all Jews to leave the country. But precisely why is anti-Jewish sentiment so widespread among the peoples of the former Soviet Union? Why do so many Russians, Ukrainians, Lithuanians and others blame "the Jews" for so much misfortune? Although officially Jews have never made up more than five percent of the country's total population, they played a highly disproportionate and probably decisive role in the infant Bolshevik regime, effectively dominating the Soviet government during its early years. Soviet historians, along with most of their colleagues in the West, for decades preferred to ignore this subject. The facts, though, cannot be denied. A thorough-going internationalist, Lenin viewed ethnic or cultural loyalties with contempt. He had little regard for his own countrymen. "An intelligent Russian," he once remarked, "is almost always a Jew or someone with Jewish blood in his veins." Two weeks prior to the Bolshevik "October Revolution" of 1917, Lenin convened a top secret meeting in St. Petersburg (Petrograd) at which the key leaders of the Bolshevik party's Central Committee made the fateful decision to seize power in a violent takeover. Of the twelve persons who took part in this decisive gathering, there were four Russians (including Lenin), one Georgian (Stalin), one Pole (Dzerzhinsky), and six Jews. To direct the takeover, a seven-man "Political Bureau" was chosen. It consisted of two Russians (Lenin and Bubnov), one Georgian (Stalin), and four Jews (Trotsky, Sokolnikov, Zinoviev, and Kamenev). Meanwhile, the Petersburg (Petrograd) Soviet -- whose chairman was Trotsky -- established an 18-member "Military Revolutionary Committee" to actually carry out the seizure of power. It included eight (or nine) Russians, one Ukrainian, one Pole, one Caucasian, and six Jews. Finally, to supervise the organization of the uprising, the Bolshevik Central Committee established a five-man "Revolutionary Military Center" as the Party's operations command. It consisted of one Russian (Bubnov), one Georgian (Stalin), one Pole (Dzerzhinsky), and two Jews (Sverdlov and Uritsky). David R. Francis, United States ambassador in Russia, warned in a January 1918 dispatch to Washington: "The Bolshevik leaders here, most of whom are Jews and 90 percent of whom are returned exiles, care little for Russia or any other country but are internationalists and they are trying to start a worldwide social revolution." The Netherlands' ambassador in Russia, Oudendyke, made much the same point a few months later: "Unless Bolshevism is nipped in the bud immediately, it is bound to spread in one form or another over Europe and the whole world as it is organized and worked by Jews who have no nationality, and whose one object is to destroy for their own ends the existing order of things." "The Bolshevik Revolution," declared a leading American Jewish community paper in 1920, "was largely the product of Jewish thinking, Jewish discontent, Jewish effort to reconstruct." As an expression of its radically anti-nationalist character, the fledgling Soviet government issued a decree a few months after taking power that made anti-Semitism a crime in Russia. The new Communist regime thus became the first in the world to severely punish all expressions of anti-Jewish sentiment. Soviet officials apparently regarded such measures as indispensable. Based on careful observation during a lengthy stay in Russia, American-Jewish scholar Frank Golder reported in 1925 that "because so many of the Soviet leaders are Jews anti-Semitism is gaining [in Russia], particularly in the army [and] among the old and new intelligentsia who are being crowded for positions by the sons of Israel." Under Lenin, Jews became involved in all aspects of the Revolution, including its dirtiest work. Despite the Communists' vows to eradicate anti-Semitism, it spread rapidly after the Revolution -- partly because of the prominence of so many Jews in the Soviet administration, as well as in the traumatic, inhuman Sovietization drives that followed. Historian Salo Baron has noted that an immensely disproportionate number of Jews joined the new Bolshevik secret police, the Cheka. And many of those who fell afoul of the Cheka would be shot by Jewish investigators. The collective leadership that emerged in Lenin's dying days was headed by the Jew Zinoviev, a loquacious, mean-spirited, curly-haired Adonis whose vanity knew no bounds. Igor Shafarevich, a Russian mathematician of world stature, has sharply criticized the Jewish role in bringing down the Romanov monarchy and establishing Communist rule in his country. Shafarevich was a leading dissident during the final decades of Soviet rule. A prominent human rights activist, he was a founding member of the Committee on the Defense of Human Rights in the USSR. This ritual action symbolized the end of centuries of Russian history, so that it can be compared only to the execution of Charles I in England or Louis XVI in France. It would seem that representatives of an insignificant ethnic minority should keep as far as possible from this painful action, which would reverberate in all history. Yet what names do we meet? The execution was personally overseen by Yakov Yurovsky who shot the Tsar; the president of the local Soviet was Beloborodov (Vaisbart); the person responsible for the general administration in Ekaterinburg was Shaya Goloshchekin. To round out the picture, on the wall of the room where the execution took place was a distich from a poem by Heine (written in German) about King Balthazar, who offended Jehovah and was killed for the offense. The whole record of Bolshevism in Russia is indelibly impressed with the stamp of alien invasion. The murder of the Tsar, deliberately planned by the Jew Sverdlov (who came to Russia as a paid agent of Germany) and carried out by the Jews Goloshchekin, Syromolotov, Safarov, Voikov and Yurovsky, is the act not of the Russian people, but of this hostile invader. In the struggle for power that followed Lenin's death in 1924, Stalin emerged victorious over his rivals, eventually succeeding in putting to death nearly every one of the most prominent early Bolshevik leaders -- including Trotsky, Zinoviev, Radek, and Kamenev. With the passage of time, and particularly after 1928, the Jewish role in the top leadership of the Soviet state and its Communist party diminished markedly. Lines adapted from the German-Jewish poet Heinrich Heine (1797-1856) were found written on the wall, by the window, in the basement of the Ipatiev House, where the Romanovs were shot and bayoneted. The distich reads: "Belsatzar ward in selbiger Nacht / Von seinen Knechten umgebracht," "Belsatzar was, on the same night, killed by his slaves." Belshazzar -- the Gentile king of Babylon who, in the well-known Old Testament story, saw "the writing on the wall" foretelling his destruction (Daniel 5) -- was killed as punishment for his offenses against Israel's God. In a clever play on the Heine quotation, the unknown writer, almost certainly one of the killers, has substituted "Belsatzar" for Heine's spelling "Belsazar," in order to signal even more clearly his intended symbolism. The Heine inscription described the racial/ethnic character of the murders: A Gentile king had just been killed as an act of Jewish retribution.